Are you looking for a Field monitors with HDMI Connection? Our Field monitors are specially designed to connect with your photo or video camera. The preview monitors display your still images or video shots with razor sharp and crisp picture. The video assist monitors, along with the light weight battery, can easily be attached to the hot shoe of your camera. The Field monitors are easy to connect to a photo or video camera. HDMI is the most common connection and ensures the best picture quality. 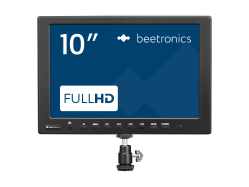 In addition, the field display monitors have VGA, BNC and RCA inputs. The camera images are razor sharp and are displayed in full screen regardless of the connection. During recording it can be difficult to see the camera’s screen. The screen is too small or the angle is wrong. A Field monitors can solve this issue. Field monitors are larger than camera screens and have a wide viewing angle of 178 degrees. In addition, the preview monitors have various functionalities that make shooting easier, such as: peaking, false colour, exposure, centre marker, screen marker, histogram, mirroring, grid, noise reduction, zoom and check field. Would you like more information about Field monitors? Contact our experts. We are happy to advise you when buying a new field monitor.